Clinton Combined Sewer Overflow Storage Facility - Syracuse, N.Y. This traditional design-bid-build project was originally designed to be a triple 18-foot diameter tunnel storage system excavated with a soft-ground tunnel boring machine. 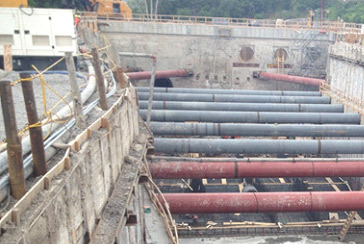 During the bid period our team redesigned the project into a triple-box culvert system that reduced cost and provided additional storage to the client. Our proposed approach eliminated risk from the original design by utilizing a deep open-cut trench supported by a reinforced CB-slurry wall and soldier pile support of excavation system.